DHAKA, BANGLADESH: After its approval in 2013, the number of farmers adopting Bt eggplant in Bangladesh is steadily increasing, from 20 farmers in 2013-14 to 6500 in 2016-17 and is likely to continue to grow in the coming years. With other GM products in the pipeline in Bangladesh, there is aneed for an organization-wide approach to drive stewardship rather than project-by-project approach, according to Dr. Vijay Paranjape, stewardship coordinator, Bangladesh, for the Feed The Future South Asia Eggplant Improvement Partnership. 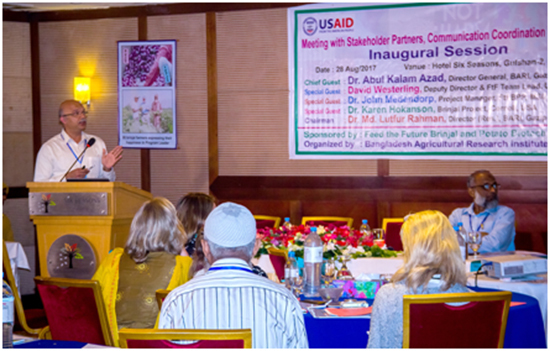 Dr. Vijay Paranjape addresses the meeting of stakeholders in the Feed the Future South Asia Biotechnology Partnership, at the August meeting in Dhaka.